Camera pages updated 30.12.2004, more images of cameras. I have interest in design and cameramaking. I prefer format 5 x 7 is "not to heavy not to light just right", between 4 x 5 and 8 x 10. 5 x 7 camera its little bigger than 4 x 5 and smaller than 8 x 10. That my opinion based on my experience. 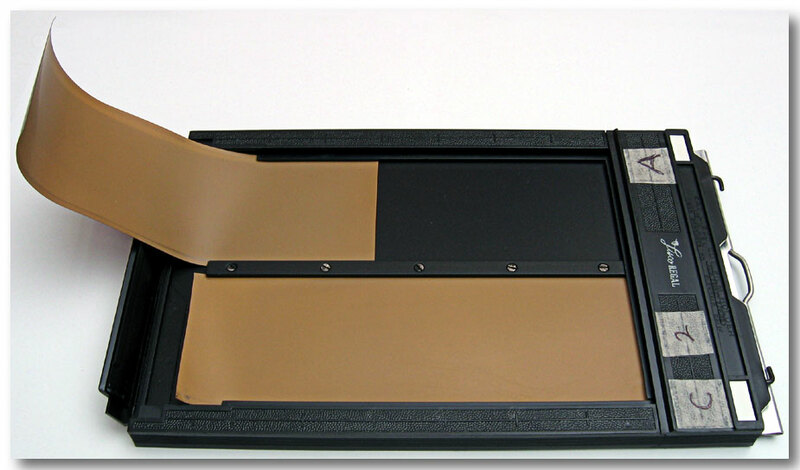 5 x 7 inch D/D holder with 120 film. 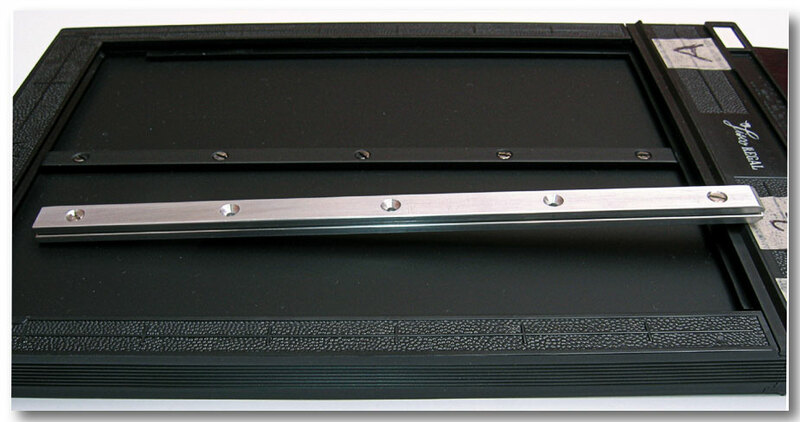 5x7 DD film holder with rail for 120 film. Cambo SC 4x5 , converted for 5x7 back. My second camera is based on maximizing use of 120 roll film. My calculation give me 4 images and 4 mm spaces. Image size is 56 x 195 mm. Me desire was to design film holder for this image size. I was told this format its not standard and development laboratory will cut to my images. This discouragement didn't stop my desire to maximize use of the film. Finally, I made two film holders and ground glass. 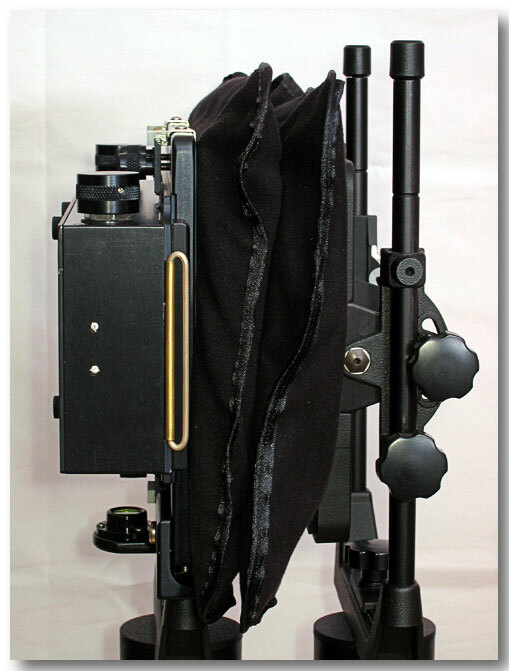 To fit film holders to this adapted Cambo 4 x 5 SC, I made back standard adapter plate. This allowed me to take even wider images. 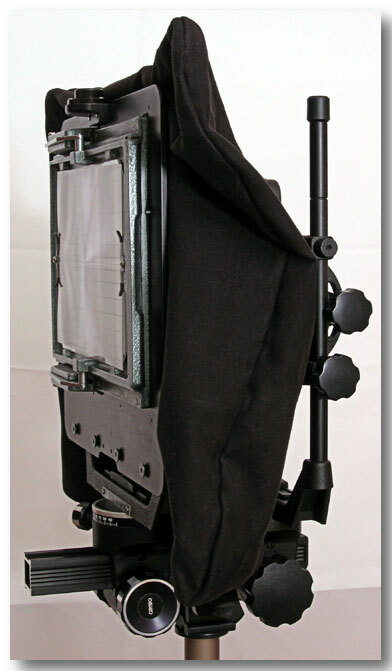 With longer monorail and bellows, lens from 72 mm to 450 mm can be used. I use 72 mm SUPER-ANGULON XL and 90mm SUPER-ANGULON XL. 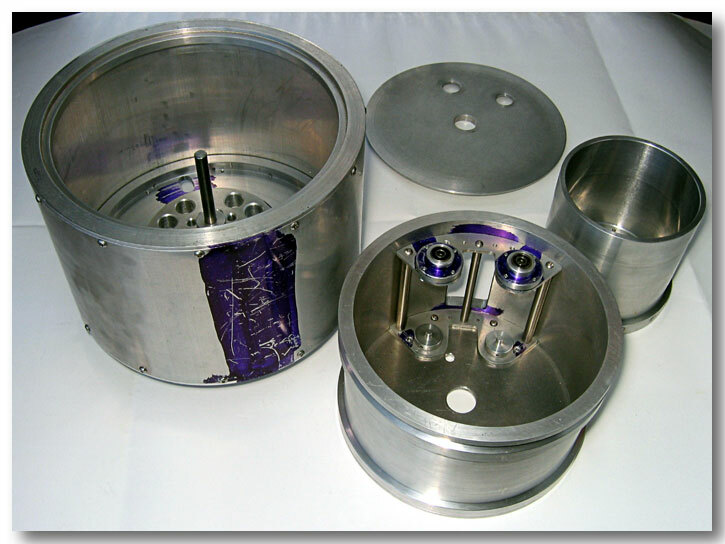 Components are made from aluminium (6061) and black satin anodized. I machined them myself. Monorail panorama camera 6 x 20 bellows compressed. Monorail panorama camera 6 x 20 bellows extended. Monorail panorama camera with 6 x 20 film back. Monorail panorama camera with 6 x 20 film back side view. 6 x 20 film back. Inside of 6 x 20 film back. Back made from 6061 Aluminium, polished and satin anodized. Other materials used Stainless steel, Brass, Bronze. I have new improved design for 6 x 20 back. Hand ground Ground glass (grid size 10mm). My third camera its "point and shut" based on 6 x 20 film holders. Again I made back plate to fit 6 x 20 film holders and G/G. 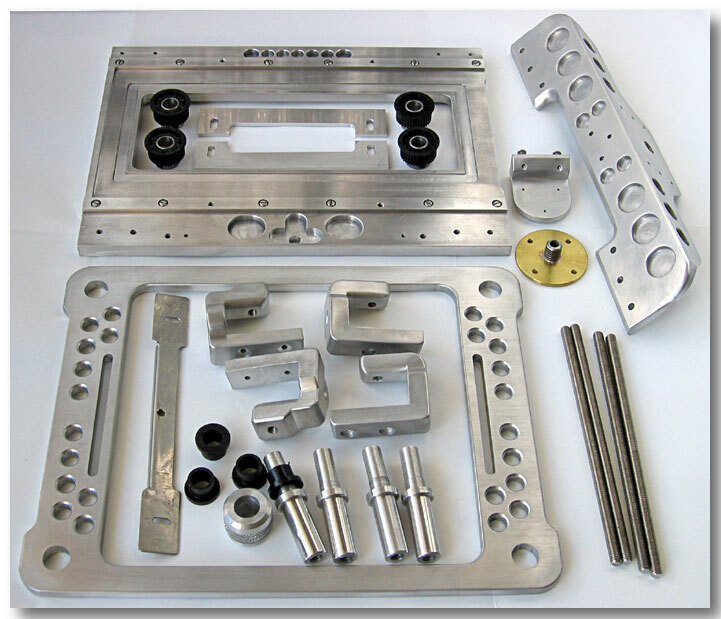 Front frame hold frame which accept Cambo lens board. Back frame have tripod mount and front can be moved for focusing. Point & shoot 6 x 20 Camera components - not yet anodized. 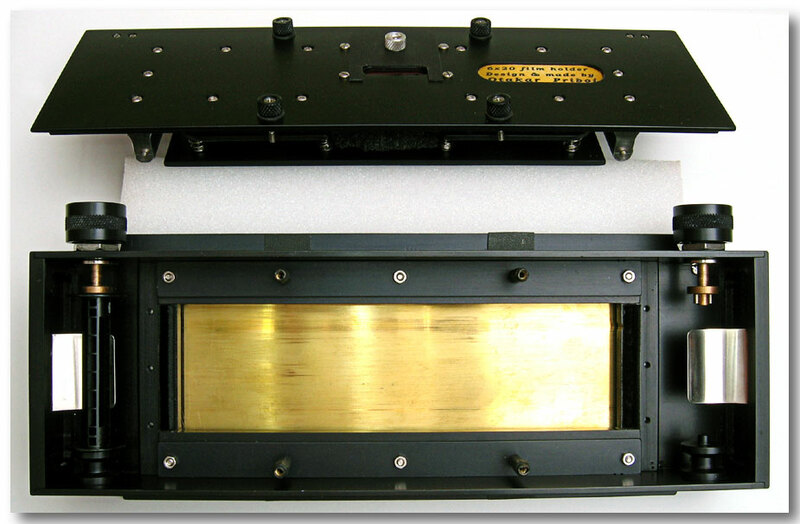 In year 2000 I began designing and building my 300° & 360° panoramic camera. Because of financial difficulties and I was site track to build others projects, work progress slowly. I will continue work on this camera. Pan_opta 300 & 360 camera. 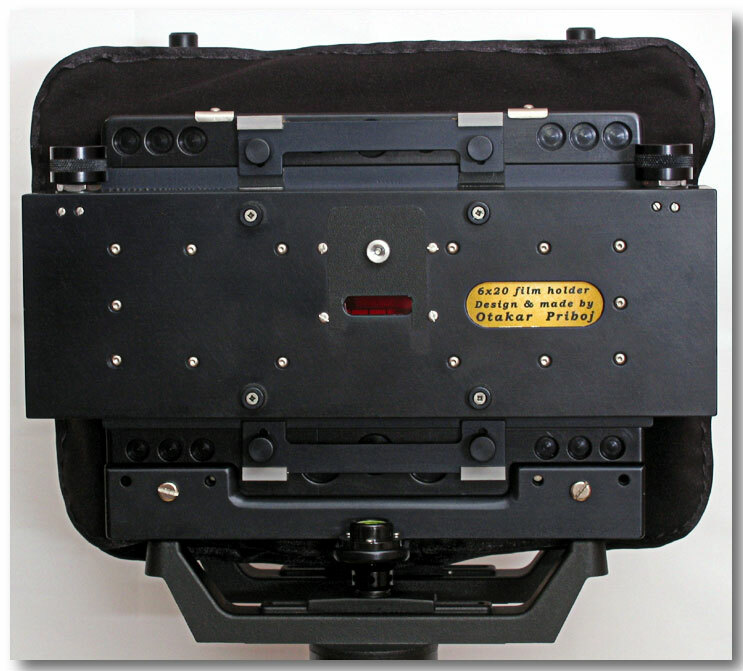 Middle front: 300° film plane for 80 mm f2.8 CZJ Biometar MC lens. Far right: 360° film plane for 50 mm f4 CZJ Flektogon MC lens. Lens will be mounted on body where is blue dye. Image size will be for 80mm lens (for 300°) 418mm and for 50mm lens (for 360°) 314mm. The frustration is that I have even more designs for panorama cameras and film holders, no time and money to build them. The results though can be improved greatly. 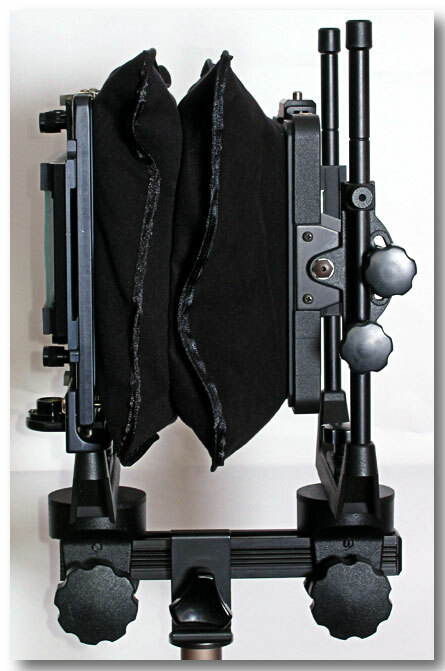 6 x 12 film holder for 4x5 camera (under G/G). 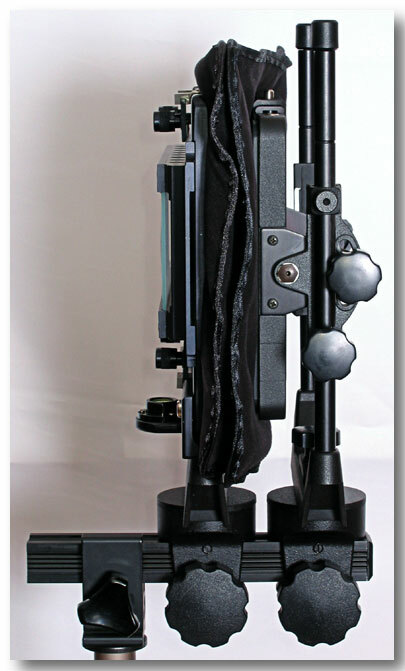 6 x 17 film holder for 5x7 camera (under G/G). Pinhole photography, BW paper as negative and contact printing. 5 x 7 Cambo SC with reduction for 4 x 5. Pentagon six, 6 x 6 ( 2 1/4 x 2 1/4 ). 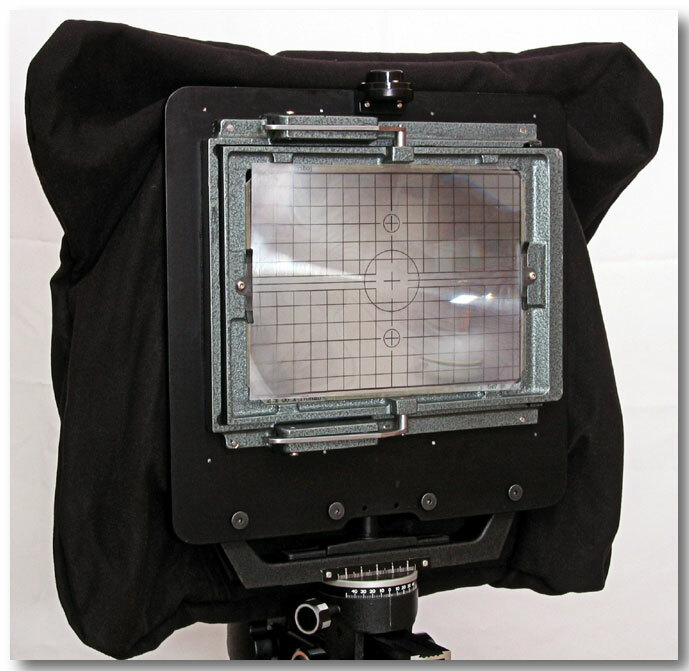 Image of Cambo 5x7 and 4x5 reduction back. Please if you have comment send email. E-mail Me! Digital imaging technology has brought new and exciting tools to photography. Today digital revolution offer some advantages over classical printing process. I use those advantages to create the stunning images. Combination Large format special build camera precise exposure, film development, drum scan and high resolution LightJet Digital Enlarger. Computer controlled laser exposure ensures that print density and colour fidelity is guaranteed across the entire print surface. Photographic imaging is a continuous tone print process that relies on colours embedded within photosensitive papers. Continuous tone printing means that there is no discernible printing dot. Many sources believe that in the years to come we will replace traditional film with digital images. While this may be true of the amateur photographer and the commercial or technical photographer, I believe that the time honoured artistry of photography, exhibited by Ansel Adams, Yuseff Karsh, Annie Leibowitz, and other famous photographers, will continue to be recorded on film. With a single piece of equipment the camera, different film emulsions can be used to control grain, contrast, tone, and texture of an image. This image, and the lighting of the subject, is composed in the artistic eye of the photographer and captures a moment in time. While we certainly believe that digital imagery is an enhancement to the portrait photographer, and its application in portrait photography will increase, I do not believe that it is a replacement for special landscape camera. Web-based images may be used at no cost for non-profit educational school projects and non-profit research projects by requesting via email and or letter and including a description of the use of the requested image.